BimmerWorld Racing approaches one of the fastest circuits in North America with confidence, as the Dublin, Va.-based team feels its turbocharged BMW 328i (F30 chassis) race cars are well suited for Saturday’s 2.5-hour IMSA Continental Tire SportsCar Challenge (ICTSC) race at Canadian Tire Motorsport Park in Bowmanville, Ontario. The cars’ 2-liter turbo engines are expected to excel on the long straights at the 2.459-mile road course, and the BMWs’ Performance Friction brake package should help them handle the circuit’s challenging 10 turns efficiently during the series’ only event outside of the United States this season. James Clay and Tyler Cooke will share the team’s No. 84 OPTIMA Batteries BMW 328i while its No. 81 BimmerWorld BMW 328i will be driven by Jerry Kaufman and Kyle Tilley. Saturday’s race starts at 12:25 p.m. EDT. Live video streaming is available at imsa.com and imsa.tv. When Saturday’s race concludes, we’re at the halfway point of the season. What grade do you give your team for the season so far, and why? What have been your biggest challenges and your biggest accomplishments so far? Are you on track to meet your goals? If not, what do you need to do to achieve them? What do you think is the most challenging portion of the Canadian Tire Motorsport Park circuit, and why? Why do so many drivers have problems with Turn 2? How suited are your BMWs for this particular circuit? Canadians are known for their passion for motorsports. Have you ever experienced this first hand? If so, in what way? How did you break your wrist, and how are you driving with a broken wrist? That would seem to be very uncomfortable at the very least. How are you coping? “While coaching a client at Mid-Ohio, I found out moped driving requires skills that I clearly don’t have. I was sitting on top of a hill at Turn 8, watching for my client, as I began to roll downwards. Instead of grabbing the brakes I took a handful of throttle and ended up rolling off and landing on my right wrist. Let’s just say that next time, I’ll be walking the track. Your BMW qualified second for this race last year, just 0.179 off the pole and new track record. Were you driving for that run, or was your co-driver? The next-closest BMW was only 0.729 off your car’s time but ended up starting 11th. What does this say about the level of competition in the series? What makes Canadian Tire Motorsport Park great? You’re coming off your best finish of the year. What did you do differently at Watkins Glen, and how can you continue to improve? You mentioned that at The Glen, your car’s balance wasn’t as good on a full fuel load as it was later in the race. What changes can you make to alleviate that? You’re British; in what way is Canadian Tire Motorsport Park like tracks in Europe, and in what ways is it different? How do you think the BMWs will fair at this track? Does it suit them, or will other tracks suit them better? What will be the keys to doing well in Saturday’s race? This track has a very active BMW Club. How important has the BMW Club been in your career? In a few sentences, can you tell us the most important ways it helps a young driver starting out? 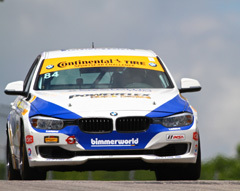 The highlight of BimmerWorld’s visit to Canadian Tire Motorsports Park on the outskirts of Toronto came with the standout performance of its Continental Tire Series rookie Andrie Hartanto. Driving the turbocharged No. 81 BimmerWorld BMW 328i with teammate Tyler Cooke, Hartanto pushed the F30-platform BMW to second place in qualifying at the high-speed road course, and quickly transitioned his front-row spot it into leading the Street Tuner class at CTMP. The sister No. 84 OPTIMA Batteries BMW 328i driven by BimmerWorld team owner James Clay and Jason Briedis qualified 11th, and with Briedis starting the 2h30m race, the second-year racer followed Hartanto’s theme by moving forward during the opening stint. Cooke and Clay would took over their respective F30s with plans of racing to the podium, but rising ambient temperatures limited the results for both BimmerWorld entries, leaving the No. 81 an unrepresentative 10th at the finish and the OPTIMA Batteries BMW close behind in 13th. “Andrie was a standout this weekend, qualifying the car on the front row to match Jason’s best this year, and leading much of his stint,” Clay said. “Our cars clearly have the speed but on a hotter track with high intake temps, especially when we start to get back in the pack, we are still hurting a little with heat-soaked turbo motors. For Hartanto, who brings years of semi-pro experience to his maiden season in the Continental Tire Series, the chance to run up front was a demonstration of his capabilities and the collective strength offered within the BimmerWorld team. And for Cooke, who has developed into one of the series’ top young pros, the run to 10th only hinted at the potential within BimmerWorld’s developing BMW F30 package. The pace and frequency of the 2015 season continues to increase as the next race at Connecticut’s Lime Rock Park arrives next week. Based on the potential shown at CTMP, Clay hopes it will carry into the short bullring circuit. 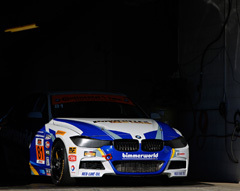 Briedis is also looking forward to taking BimmerWorld’s OPTIMA Batteries BMW into the thick of the fight at Lime Rock. A trip north of the border to the famed Mosport road course resulted in BimmerWorld’s brightest day of the season with its brand-new turbocharged BMW 328i built on the F30 chassis platform. Just past the halfway point of the Continental Tire Series season, BimmerWorld team owner/driver James Clay and teammate Jason Briedis came home fifth in the Street Tuner class as the duo used all of the handling, braking and acceleration available to shine in Canada. BimmerWorld made the bold decision to take on the sizeable F30 development project to build tows the future in the Street Tuner class, and to expand the Virginia-based team’s expertise and aftermarket offerings for the German sedan. With one F30 and three BMW E90s competing under the BimmerWorld tent this year, Clay says at its current rate of development, a second F30 is in the pipeline to replace one of the E90s. The fifth-place result for the No. 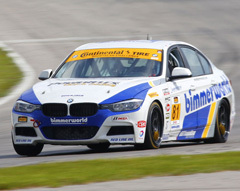 84 BimmerWorld F30 also represented the top finish within the team at Mosport, and Clay credits his rookie co-driver, who worked his way up through BimmerWorld’s Driver Development program, for a big part of the excellent outcome. Corey Fergus: Mosport was a better track for the BMWs. It was my first time racing there, but I quickly realized how great of a track it was. It’s all about momentum and carrying speed without slowing the car down too much. It’s a true driver’s track. Everything just came together for me and it really clicked. The car felt great and I felt fast; like I was where I needed to be. Unfortunately, I didn’t get a chance to show my stuff. That’s racing I guess. Tyler Cooke: P10 isn’t a bad result at all, but it’s also not the best result we wanted. The race was a tough race with a track that is very hard to pass. P10 has still kept us in the points and I think we have a great shot to do well at Indianapolis. Seth Thomas: Our race was pretty typical of a race at Mosport where it becomes a chess match on how to gain positions. I didn’t play chess that well this weekend as I picked some of the wrong moves on the restarts where I would either get pushed off the track or would have to back out of the throttle to avoid a wreck. After that I got stuck behind a car that was really good at accelerating out of the turns but not so great on corner entry. It didn’t seem to matter how well I would get the entry right I didn’t have the speed coming out to make the move stick going into the next turn. Towards the end my tires were going away so I did what I could to keep my spot. Overall it was a race where I am glad we came home with some points. Jason Briedis: It was definitely satisfying running closer to the front of the field. It’s also nice to be seeing improvement each weekend. We have put the car in a good position during several of the last races so it’s nice to get a finish reflective of our capability.